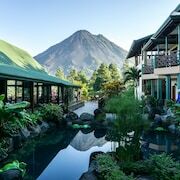 This family-friendly La Fortuna hotel is within 1 mi (2 km) of Ecotermales Fortuna and Arenal Volcano National Park. Arenal Volcano is 2.2 mi (3.6 km) away. Great variety of pools and spas for kids and adults. Really nice property. Everything was good and as advertised. 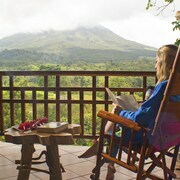 Beautiful view of Arenal mountains, great walking trails and excellent breakfast. Would definitely recommend! Where to find Arenal Volcano National Park hotels near an airport? How can I find hotels in different Arenal Volcano National Park neighborhoods? Where can I find hotels in Arenal Volcano National Park that are near tourist attractions? Costa Rica is known for its magnificent vistas and stunning cloud forests, and there’s no better way to capture that beauty than by staying at the best hotels in the Arenal Volcano Region. 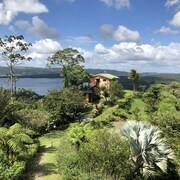 Bordered by Nicaragua, this northern area boasts some of the country’s most splendid attractions: Arenal Volcano, Los Angeles Cloud Forest, and Lake Arenal. What’s more, it’s not difficult to track down cheap deals and discount rates on Arenal Volcano Region vacations, so you can enjoy the tranquil atmosphere without losing your financial peace of mind. Ready to start exploring? 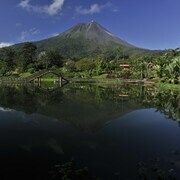 Let Expedia guide you through the top places to stay and things to do in Arenal Volcano Region. 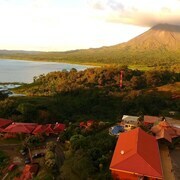 Arenal Volcano Region hotels are located in several distinct areas: Fortuna, Tilaran, Los Chiles, Quesada, and San Ramon. Where you choose to stay, of course, depends largely on what you’re hoping to experience. If you’re planning a trek to the geological wonders, book a room near Fortuna. Located at the base of the mountain, this charming town is the best jumping-off point for volcanic hikes. Its waterfalls, refuges, and butterfly conservatories are also out of this world. Want to unwind in some of the country’s most tranquil hot springs? 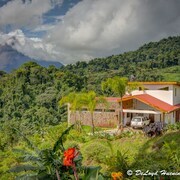 Search for an Arenal Volcano Region hotel near Quesada. This city is the region’s largest, and it’s a great place to kick back for a few days. You’ll also find incredible deals in the towns surrounding the lake, so make sure to browse the Arenal Volcano Region hotel deals and budget options before you click confirm. When you’re ready to plan your getaway, use the travel tools at Expedia to lock down the essentials. We offer an impeccable selection of flights, packages, and car rentals in Arenal Volcano Region, and we’ll always help you score the hottest deal. Costa Rica is expecting you. 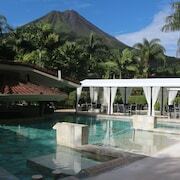 What are the most popular Arenal Volcano National Park hotels? Lovely Bright Lake Home Sleeps 6, Spectacular Views & Free Night Hike! 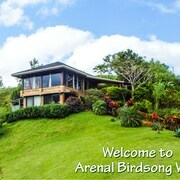 Encantada Guest House: Villa Just for Two, Spectacular Views & Free Nite Hike! 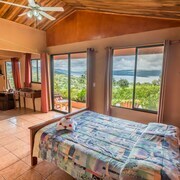 Villa Esperanza, Breathtaking Views of Lake & Volcano Arenal...! Are there hotels in other cities near Arenal Volcano National Park? What other types of accommodations are available in Arenal Volcano National Park? Explore Arenal Volcano National Park with Expedia.ca’s Travel Guides to find the best flights, cars, holiday packages and more!